This game is for those, who is not afraid of any troubles and especially, wild animals. 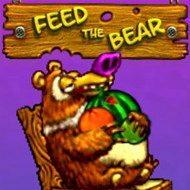 Cause here you will have to feed this big bear! Just sink into the world of games, and help this animal. Use th catapult and throw different fruits into his mouth. Have fun! Are you scared of the bear? Well, in this game you have to feed this huge animal! Yeah! He is waiting for you right now! Do you actually know what they like to eat? They eat fruits too! Could you believe that? So, in this game we propose you to throw a food directly to his mouse. So, everything is up to you now. Make only the most direct throw and get more points. Be sure that you can cope with it and make this big bear happy! Good luck to you and enjoy the game. Just have faith in yourself.